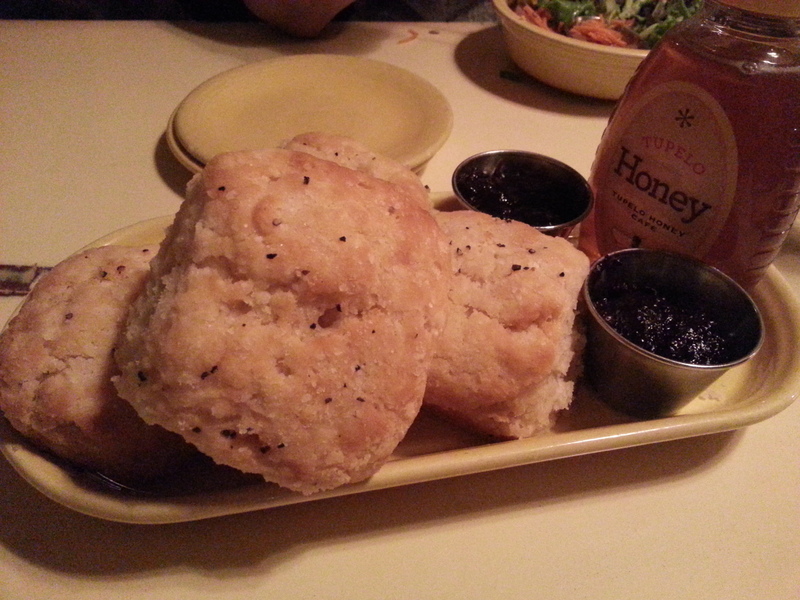 On this recent trip to the south I never thought I’d come across such a hidden gem as Tupelo Honey Cafe. It’s a pretty unassuming restaurant from the outside looking in, but after stepping into the cozy interior and glancing over the menu, I was immediately intrigued by all the interesting items offered by Chef Brian Sonosukus. The menu was distinctly southern, but with a lot of exciting unique twists and takes. I was able to try a few of the outstanding dishes and cannot speak highly enough of the great cooking being done at Tupelo Honey Cafe. When I got home, I went online and bought their recipe book; hopefully I can make a couple good items and share later on. Their rosemary peach tea has a great aroma from the intense rosemary, and their raspberry iced tea is good too. I was intrigued by their local beer selection but we were halfway through a long drive so I passed. Onto the food! These were great biscuits, really fluffy on the inside while having a delicious butter aroma permeating the entire biscuit. The sweet honey and preserves only further added to this decadence. I thought I was already at dessert, eating a great cake. I read the description of this grilled cheese and my brain kind of short-circuited as I imagined how delicious it’d be. Luckily, I wasn’t disappointed. The nicely melted creamy rich cheese was just outstanding, while the crunch of the sweet bacon and subtle bite/sweetness of the caramelized onions brightened up the sandwich. 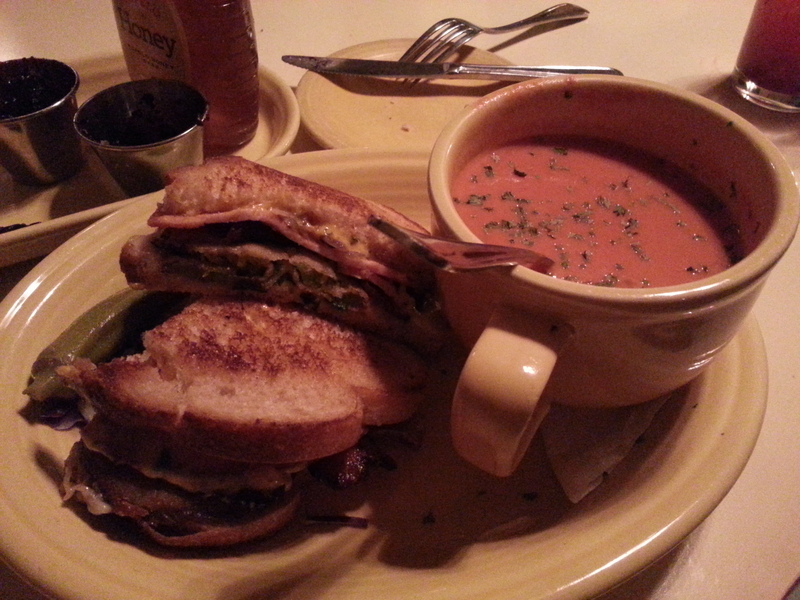 I’ve had a lot of grilled cheese sandwiches before, and a lot of tomato soups, but actually never together despite it being a classic American combo. I understand the appeal now. Souther Fried Chicken BLT: Crispy fried, natural, hormone-free, chicken breast, maple peppered bacon, dijonnaise, fresh lettuce & tomato on an artisanal bun. I also ordered a side of mac & cheese. As if this meal didn’t have enough fat-boy-food yet. 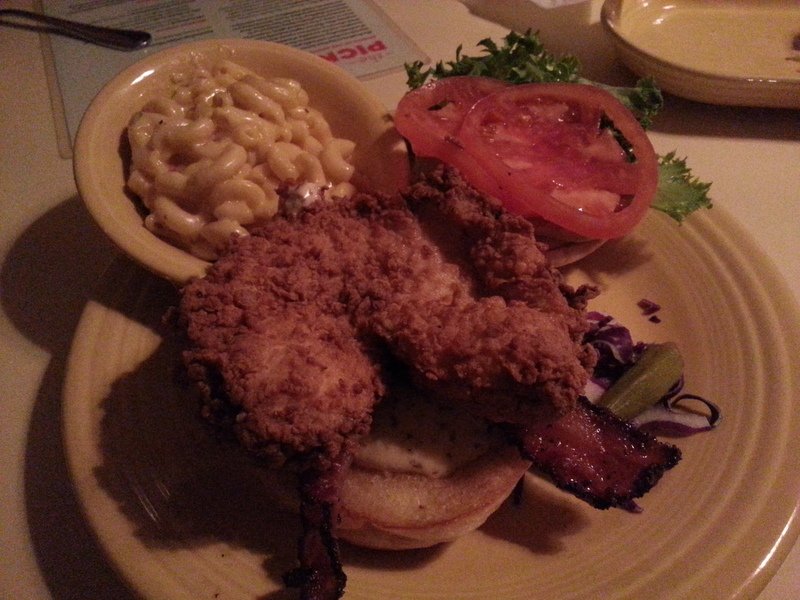 I can see with full confidence that this is the best fried chicken sandwich I’ve had, ever. The chicken itself was amazing and might’ve been the best southern-style fried chicken I’ve tried (although I can’t declare it my favorite fried chicken ever since I also love korean-style fried chicken). It was so crispy on the outside, and yet juicy on the inside despite being a good inch-thick. Normally chicken that thick either becomes overcooked and dry, or it’s undercooked in the middle. I was blown away by how tender the chicken was. You have to come try it for yourself. The dijonnaise was the perfect condiment to go along with this chicken, with it’s wasabi-esque spicy floral aroma and subtle sweetness. Plus bacon, fresh soft bread, etc. – this sandwich is amazing. Sweet Potato Pancake: large buttermilk pancake flavored with cinnamon and roasted sweet potatoes, topped with whipped peach butter, spiced pecans, and maple granola. This pancake is up there with Prune as a contender for best pancake I’ve tried yet. 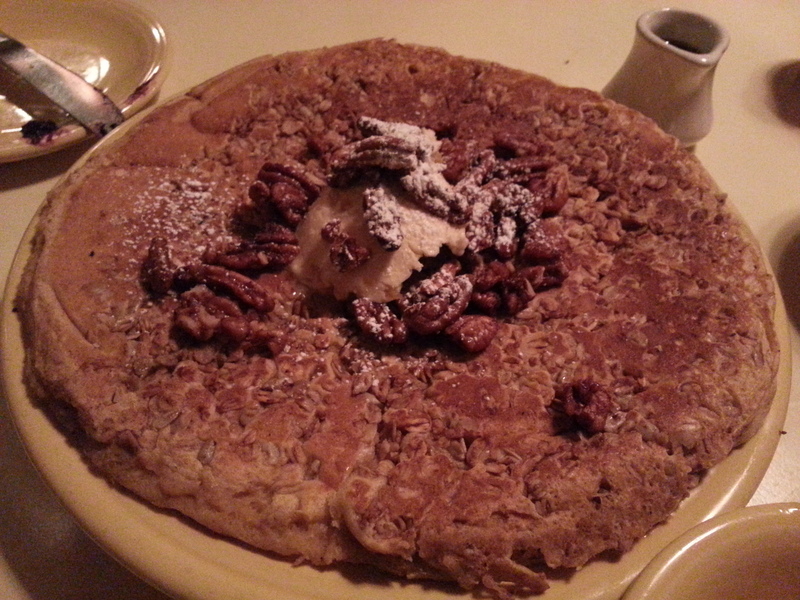 This behemoth of a pancake was crispy on top from the granola, and amazingly fluffy on the inside. The sweet potato and cinnamon flavors really brought a warmly comforting taste to the pancake. The spiced pecans were actually kind of spicy, and added a nice further crunch to the fantastic cake. I felt like it was thanksgiving all over again (which is a great thing, of course). Oh man, they know how to do pie right in the south. 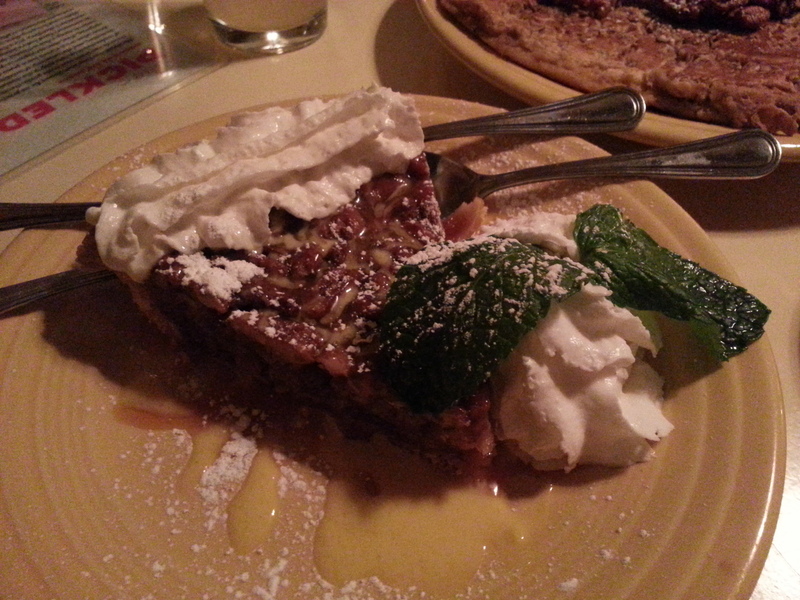 The banana cream pie at Emeril’s was already in the running for best pie I’ve ever had, but then this pie came out of nowhere and is now a strong contender too. It was pretty sweet but not overly so, with a great crunch from the pecans. The rich brown butter, combined with the aromatic vanilla and nutty spiced pecans all made for a fantastic bite of pie. We finished everything. Literally, everything – every drop of whip cream, maple syrup from the pancakes, any crumbs, everything. The food here is that amazing, and I can’t wait for my cookbook to come so I can try and recreate this fantastic grub at home.